While it is true that the vast majority of car accidents are caused by human error, substandard road design can also be blamed for fatal crashes, rollovers, and head-on collisions. Blind curves, abrupt speed limit changes, and excessive congestion can all lead to serious car accidents resulting in injury or death. Do you understand the inherent dangers of poorly designed roads, and the type of injuries motorists can sustain? Do you what you can do if you or a loved one has been injured in a car accident because of improperly designed roads? If you do get injured, working with an experienced Colorado Springs car accident attorney can make all the difference in your outcome. Every driver should be attentive and when behind the wheel. However, even the most conscientious of drivers can fall prey to poorly designed roads. If lanes are too narrow to allow for the traffic to flow safely or turns are too sharp, it can be difficult to avoid an accident. Colorado drivers must deal with their fair share of winding, curving roads. If those roads are not properly marked or don’t have safety guardrails where necessary, it could easily result in a perilous situation for the occupants of the vehicle. Steep shoulder drop-offs are another potentially dangerous flaw in road design. While a small amount of drop-off is typical, anything greater than an inch or so can be devastating. If the wheel of your vehicle gets caught on the edge of the road, you could lose control of your vehicle. In an attempt to regain control, a driver could easily over-correct, sending your vehicle farther off the road or into oncoming traffic. Accidents involving passenger cars, trucks, and motorcycles could result in traumatic brain injuries, spinal cord injuries, burns, permanent scars, amputations, or even death. It is important to have an experienced Colorado Springs attorney who will work closely with your medical care provider to establish all costs associated with emergency room care, surgeries, and physical therapy, in addition to any future care you will require due to your injury. City, county and state governments, in addition to engineering firms and contractors, can be held liable for injuries and fatalities resulting from wrecks caused by dangerously designed roads and bridges. 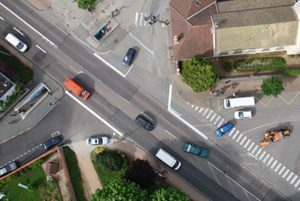 Sometimes, there may be a history of car accidents associated with a particular intersection or stretch of highway, demonstrating the menacing nature of the arrangement or construction of the road itself. If you have been injured in an accident caused by a flawed road design, you are entitled to compensation for your losses. If poor road design contributed to your accident, you may have cause to file a lawsuit. Contact the experienced Colorado Springs personal injury attorneys at the Green Law Firm today to schedule a no-obligation consultation and discuss your case. Call us today at 1-719-694-8515.